According to the Litill Ltd. homepage a full website is coming soon. I'm waiting with baited breath - these are phenomenal. Love the hand blown glass shapes. 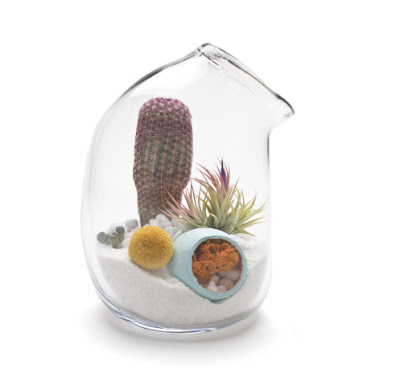 They reminds me of Paula Hayes' terrariums. The colors are amazing against the bright sand! I'm guessing these will be pretty expensive. I guess the "sand" is some sort of special mix? Cacti would die in sand. How can cacti (which don't like water or humidity) and air plants (which need a few soakings a week and humidity) thrive in the same terrarium?